The next best thing to actually playing basketball is playing virtual basketball. When the conditions are too cold, windy, rainy, snowy, or you’re just plain lazy, virtual basketball is great to pull off things against competition that you cannot do in real life. I’m bringing the heavy hitters from videogame classics I personally played, and somewhat mastered, from the late 1980s till current times. 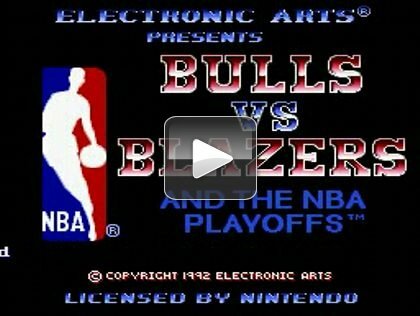 I haven’t played every single basketball videogame known to man because either the game sucked or I didn’t have any money to afford it. If the game made my list, consider it prestigious and honorable. You knuckleheads will disagree with the placement on “The List,” but be thankful that the game made it. Here is the number ten best basketball game of all time according to me. It’s been a damn long time since I played this game. My older brother bought this game somewhere in 1992. We had only three games at the time. It was this, Street Fighter 2, and Super Mario World. We played the crap out of this one. For the noobs reading this, this was a time when Michael Jordan and Scottie Pippen were dominating the 90s. The Super Nintendo wasn’t as advanced in sound and graphics like the Xbox 360 and PlayStation 3, but back then it was better than the NES. This was the first game I played where it actually “felt” like simulation basketball. And check this out. Michael Jordan was actually in the game with his face! Sometimes I did not even play the game. I left the menu on and listen to the music. Yes, that was my jam! The positives: First real simulation basketball game. Graphics and sound were better than any game before it. Michael Jordan is in here. Game play was very simple. There is no complex combo presses to pull off crossovers. The atmosphere sounded like a bingo hall causing me to chuckle sometimes. Inbounds play led to automatic three pointer made. Don’t know why. The negatives: There is no crossover. You can’t cross over anyone. There is no simple between the legs and behind the back dribble. There is no bench to substitute players. There was no fluidity. Players moved around like they were running in molasses. There was no regular season. The horrendous: Scottie Pippen’s mug looks like a Dickey Simpkins x Stacey King collaboration. He’s even sporting a gap. I can’t believe it. I’m not even sure if that should be horrendous or hilarious. Clyde Drexler somewhat resembles The Black Burt Reynolds. Wait, Burt Reynolds is rocking a tan isn’t he? Eh. Many hours were spent playing this game, watching the Simpsons and Married with Children, and then back to playing this game. After watching some NBA on NBC, my brother and I go back to playing. This game severely pales in comparison to today’s games, but nostalgia is what keeps me coming back. The music aged well except for the rest of the game. Scottie Pippen’s mug is hilarious, though.